“Keeping Up with the Kardashian” star Khloé Kardashian speaks her mind about estranged hubby Lamar Odom. In a new clip for Sunday’s upcoming episode, Khloé has a heart-to-heart with sister Kourtney and reveals the NBA player did indeed cheat on her. "The way I was living is not a way to live!" 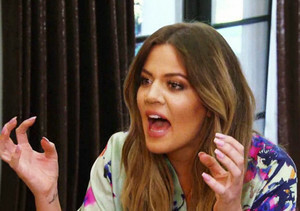 a frustrated Khloé exclaims in the clip. "I kept in hiding every time there was something going on. I would have to lie, or conceal, or cover up, and I'm so over it!" She continued, "Let me tell you something. Last year on my birthday I lied to everyone because I had to lie and say I was with my husband, when in fact my husband was missing with another girl!" Tune in to “Keeping Up with the Kardashians” at 10PM Sunday on E!